For many, the sight of pink ribbons, pink gear and even pink trucks mean it’s October, a month where we raise money and awareness for breast cancer testing and research, and then go right back to our lives, often forgetting about this terrible disease for the next 11 months of the year. Not for Marilyn Otto, newest owner of LINE-X of Albany, New York franchise. 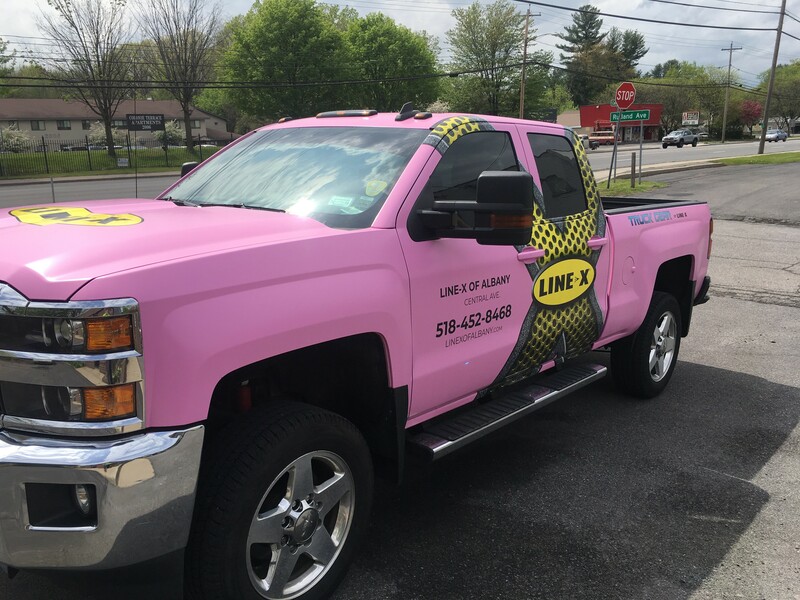 Her big, bold and bad pink LINE-X 2015 Chevy Silverado LTZ boasts a LINE-X PREMIUM bedliner, leveling kit, nerf bars and a gorgeous pink vinyl wrap, and it’s used to support breast cancer fighters and survivors year-round. In addition to attending local events, Marilyn and Ben work with several other local charities, including the Nancy Clemente fund, which offers holistic treatments to breast cancer like massages and reiki, Velvet's Totes for Hope which provides a tote with items that make the patient more comfortable on treatment day, and Visions of Strength at Hildegard Medicus Cancer Center which will receive a free LINE-X spray-on bedliner as part of the charity’s annual silent auction.